Tributes for that personal touch. 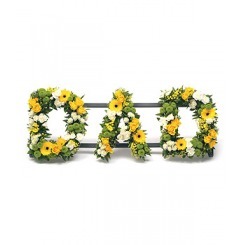 If you would like something in particular and can't see it on our website please contact us on 01522 524169 or enquiries@chambersflorists.co.uk to discuss your ideas. DAD in yellow, green and white. Please note that all flowers are subject to availability and substitutions may be made at the florist's discretion. 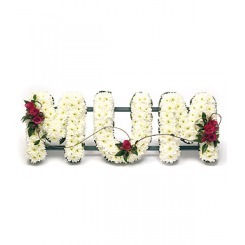 MUM, based in white with pretty pink sprays. Please note that all flowers are subject to availability and substitutions may be made at the florist's discretion.